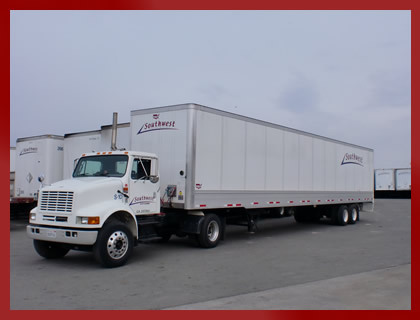 “Standard” Maintenance Guidelines- In this arrangement Southwest Trailer Leasing is responsible for handling the maintenance and providing for replacement of normal wear parts such as tires and brakes. The customer pays a per mile charge which is billed on an interim or estimated basis as miles occur. Customers who are not equipped to handle maintenance often choose to have Southwest Trailer Leasing take care of the trailers so they can concentrate on their operations, not maintaining equipment. As well, paying per mile on an on-going basis insures any charges that may occur when returning the trailer are minimized. “Net” Maintenance Guidelines – In this arrangement the customer is responsible for maintaining the trailer including the tires and brakes. Upon delivery of the trailer a detailed inspection is completed and a notation made to gauge the total tire and brake depth on the trailer. Upon return the same inspection is made. The customer is charged a per 32nd charge for tire tread depth used and a per 1/8th charge for the brakes used. Often times customers who are equipped to handle trailer maintenance find this to be the most economical route to go. In addition to these maintenance services Southwest Trailer Leasing offers 24 hour emergency road side assistance through our partnership with FleetNet America, the country’s leading provider in after hours service for transportation equipment. Please call your local Southwest Trailer Leasing branch for service during normal business hours (8-5) or call 800-972-8872 for after hours service. FNA has a highly trained staff and access to over 60,000 vendors nationwide. “Normal Wear” Guidelines – We are also very concerned about damages and return charges and want your transaction to be smooth and hassle free. Read our Normal Wear Guidelines to be clear what we consider damage and normal wear. You will find when dealing with Premier we are the most fair and reasonable in the industry when damages are concerned. We want you to be a customer for life. “Tire Repair” Guidelines – Tires are perhaps the most contentious issue when renting trailers. Again, we want your transaction to be smooth and hassle free. Read our Tires Repair Guidelines to be clear what we consider damage and normal wear. You will also see both yours and Southwest Trailer Leasing responsibilities when it comes to tires. Should questions arise contact your local representative. Customer fleet- If you have your own trailers that need repair, Soutwest Trailer Leasing can offer you top quality service with the lowest prices in the area. Call us today for an evaluation of your service needs. For any repair service needed during our Normal Business Hours (8:00 am thru 5:00 pm M-F) please contact your local Southwest Trailer Leasing branch.